Pancakes. With just that one word I get weak at the knees. Add lemon, ricotta and that’s it…I’m done! This recipe for Easy Lemon Ricotta Pancakes from scratch is the perfect way to celebrate Shrove Tuesday, or any day as far as I’m concerned! I confess. I love pancakes. I don’t really need an excuse to share a pancake recipe with you, but this time, this post is to celebrate Shrove Tuesday (also known as Pancake Tuesday). Not to mention the fact that this would also make a great breakfast for your Valentine Sweetheart! My love for pancakes goes back to my childhood. My “Italian” upbringing did not include pancakes. But ohh, the power of television and the commercials back in the day. I can still remember when this commercial for Aunt Jemima pancakes would play. I was obsessed, even as a child – I needed try these American pancakes. My poor mom finally gave in and for so many years, Aunt Jemima would make a visit in our household, every Friday supper, syrup and all…until, as I got older, I found out how easy it actually was to make pancakes. I will be forever grateful to Aunt Jemima! As you may have noticed, I enjoy my pancakes with lots of fresh fruit and a sprinkling of icing sugar. Sometimes I’ll add a dollop of yogourt. You can dress these Easy Lemon Ricotta Pancakes from scratch any way you like. The flavor combination of lemon and ricotta is so refreshing! If you are looking for more pancake inspiration you can check out this recipe for quick easy oatmeal pancakes or perhaps this recipe for buttermilk pancakes. Nutrition Tip: If you are trying to increase the amount of dietary fiber in your diet, try adding a couple of tablespoons of ground flaxseed to your pancake batter. No one will know it’s there…only you. And you know it’s good for you. A tablespoon of ground flaxseed will provide you with about 2 grams of fiber. It might not seem like much…but every little bit helps. The inspiration for these Easy Lemon Ricotta Pancakes from scratch came from this recipe from the kitchn. Here are the changes I made: I switched out regular milk for buttermilk; I added lemon zest and juice to the batter; and I increased the baking powder just a bit. Don’t be tempted to skip the step where you beat the egg whites and the yolks separately. This is the secret to getting truly light and fluffy pancakes! It gives me so much pleasure to share these Easy Lemon Ricotta Pancakes from scratch with you. Hope you all have a great week! 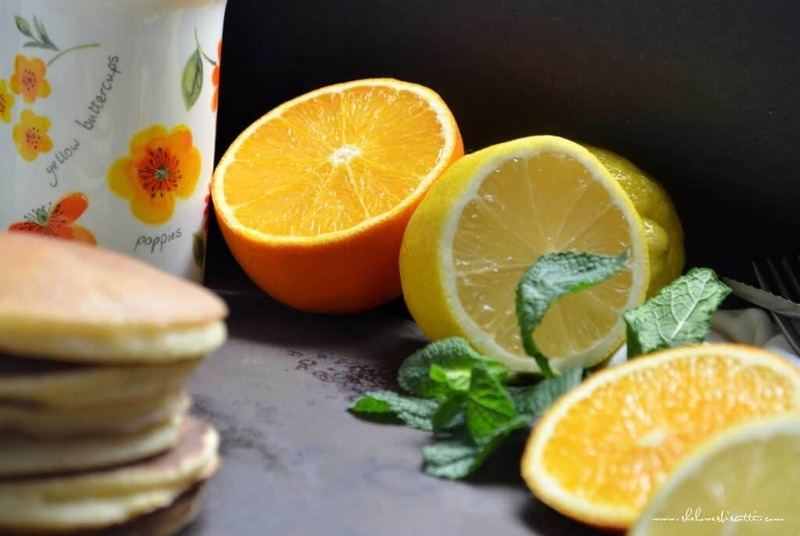 This recipe for Easy Lemon Ricotta Pancakes from scratch is the perfect way to celebrate Shrove Tuesday or any day as far as I'm concerned! In a small bowl, sift together flour, baking powder, sugar and salt. Set aside. In a large bowl, whisk together ricotta, buttermilk, egg yolks, vanilla, lemon zest and juice. Gently add the dry ingredients to the wet mixture and fold until just combined. Set aside. With a handheld electric mixer, beat the egg whites until stiff peaks form. Stir a couple of tablespoons of egg whites into the pancake batter. Gently fold in the rest of the egg whites with a spatula. Melt a small pat of butter and brush around the pan. Drop batter in 1/4 cup dollops onto the hot pan. Cook for about 2-3 minutes until golden on the undersides and you see a few air bubbles forming on the top sides. Gently flip the pancakes and cook for another 1-2 minutes or until golden. If you are trying to increase your intake of dietary fiber, try adding a couple tablespoons of ground flaxseed to your batter. Now I will have to attempt this one! !